2 What Should I Be Doing? I trust you will enjoy them as much as I have and you will see by the picture on the left just why dogs are on my mind at the moment. 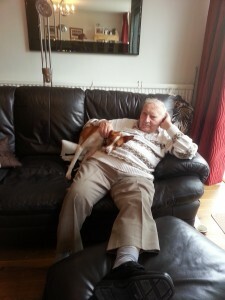 After having my Dad to stay, plus family visits to “celebrate” his 93rd birthday – the first without Mum – I crazily volunteered to look after my second Grand-dog for a couple of weeks. He’s gorgeous but just too tempting to leave to his own devices. Besides which, leaving him alone is not advisable – when he gets bored he knows just how to get my attention….. Not that you can be cross with his little antics. When Dog-dog came to visit he probably recognized my Dad’s grief, ran over to him and put his head on Dad’s chest to give the unstinting love that only a dog can give. And now my Dad has gone home again, Dog-dog is soothing my stresses too. My Dad’s bank messed him about something rotten – it’s a joint business bank account (yes at 93 he still runs a business!) but they saw fit to close it when Mum died, leaving him for WEEKS with no business bank account. I’ve done what I can to help, but officialdom rules (and a little stubbornness from my Dad too, it must be admitted). My blog layout (yes this one) is now frustrating me by appearing full width at random intervals, and with a side-bar on other occasions – I’ve looked at all the obvious settings. Not a clue! Yet despite all the above crying out for my attention I have a total inability to focus completely on anything work-related. So I am having a few days when I just do whatever of my offline work I can cope with, but give some much needed TLC to Dog-dog and ME! You could be forgiven for wondering how Dog-dog got his unusual name. Dog-dog loves his little “pack” and they love him. (Yes – all due cautions are being observed.) The first day they left him with me while they went on holiday he was sad and looking for them. But it didn’t take him long to get me wrapped totally round his little finger (yes, I think dogs DO have little fingers to ensnare humans). Dog-dog’s history is sad – Russ and Laura found him in Spain in terrible shape. Possibly set on by other members of his hunting pack, then some *!&%£? * humans (I use the word “humans” loosely) found it entertaining to stub cigarettes out on him. I’m normally pretty placid, but if I could get my hands on them…..
First off Laura and Russ left food out for him and be-friended him, then as the summer weather turned into winter chill one morning Russ told Laura…. “I have to confess, I let Dog-dog sleep inside last night” and of course he’s never looked back since. Laura tended to his wounds and protected him from two legged and four legged predators. She took him to the vet, got him “fixed up”, vaccinated, passported him and all the other formalities to bring him back to the UK. He’s progressed from cheap dog-food with additives that made him hyper-active to good quality organic food, and he’s settling down. I fear he’s still got a long way to go before he’ll be confident with other dogs, but he forgave humans pretty quickly – isn’t that amazing? So Dog-dog has a happy ending, and is now soothing my troubled soul too. In fact it’s time for “Walkies”! Normal blog posting will be resumed shortly, no doubt – meantime I hope Google will forgive my temporary change of topic from Internet Marketing and Online Business! It is quite okay to go off topic and I love the quote about dogs you put out, and thank you for the great post even though it is off topic and that is ok. Sometimes you need a break and you won’t be penalized for that. I guess one of the best parts of Life as an Internet Marketing is that I CAN take a little time off and digress too. Germany our friends adopted a dog from Spain ,his name was Pakko. He came as a baby and we did not know how big he would be later. Because all have been working the whole week ,he did not get big walks. The only one who went for longer walks with him was me ,ones a week. to open field where no bikers are and let him run. I loved hearing about Pakko – these Spanish dogs must be real heart-snatchers! It’s so nice to get a real “doggy welcome” – there’s nothing to beat it is there? Must confess it was 6 months since I first saw Dog-dog (in Spain) so I did wonder how big he would have grown and whether I would be able to manage him on his lead. Happily for me he’s still very small – I can easily pick him up when he starts getting “out of his depth” with other dogs! Talking of which – almost time to go…. Another dog lover this side! I’ve always had one right under my cradle from the time I was born, and I’m glad it carries on with the family, to date! Loved this quote – “A dog is the only thing on earth that loves you more than he loves himself.” – have read and used it so often too. Nice to see your Dad, and I am so glad you’re spending more time with him, especially after your Mom – and they need us now all the more. Yes, we’re a real family of dog lovers – I just had to drag myself away from my little visitor tp spend some time on my blog. He also enjoyed sitting with my Dad. I’ll miss you on my blog over the summer – but I know you deserve a break, so enjoy your summer break. I know it’s work too, but “a change is as good as a rest!”. I find this post quite refreshing. You are going through a time where you are spread too thin and the best thing to do is to write about what is going on in your life. We are human…not robots. Loss of your mother, and caring for your dad on this first occasion has to be THE most important job for now. We cannot push ourselves too hard otherwise we break. I once did and had a bout of overwhelm where I couldn’t function for two weeks. I didn’t want to blog, look at emails or go on social media. But taking time away is OK as long as you don’t give up. Your mind/body/spirit needs rest so writing this is purely refreshing Joy. As for dogs…I have two and they both came from horrible places. Its a darn shame what happened to dog dog. Those people should have the same karma. When it comes to dogs, I do get crazy about that sort of thing. One of my dogs was left for dead in a cage where his siblings lied dead on him. It was a breeder who was crossing an American Eskimo with a Poodle to create an Eskipoo. Thank God it was raided. When I heard this little fellow’s story I had to get him. He was underweight, matted and fearful of just about everything. How he lasted 9 months in that horrible place is a miracle. It took a long time for him to eat and even drink water. Would you believe 2 years? Yes..It did take us two years for him to get healthy. Now he is so affectionate and will eat without shaking. My other dog is a Blue Tick Hound. He was on his way to be put to death when The Blue Tick rescue team got him and drove him from the south to the north east. He is a bundle of joy. No one wanted him because his ears don’t reach his nose. So for this breed, they put them to death. How my heart broke when I heard this. He is our best friend. Ooops I’m realizing I’m writing a novella so I’ll stop, but you can see here that I have a strong passion when it comes to dogs. I cannot live without them. I am thinking of a third one, but have to wait and see. These two boys of mine need a girl dog to keep them in line. I’m glad you, and many others, understand my need to just waffle on about dogs and family at the moment. My Dad needs my help and support, and given that he’s helped and supported me for more years than I fancy admitting to….. well, I owe him big-time! It is also helping me to take a mini-break and catch up with some of my other work, so this is a pleasant interlude without giving up. Another dog-lover then Donna! We’re everywhere. But imagine being sentenced to death because your ears don’t reach your nose. Outrageous! Thank goodness you and the Blue Tick rescue team were there for him. AND the other little chap. Such cruelty is beyond belief, but at least both fellows are now safe and happy. We’ll look forward to hearing if you get your girl dog to keep them in order. And now I must go back to stroking duties! Bless your heart, I know it must still be very hard. I’m so sorry your Dad wasn’t in the celebrating mood. I can only imagine losing his beloved wife and having to not only go on without her but keep celebrating another year must be really rough on you all. Glad that dog-dog was a comfort to him and what a story about his beginnings. It’s hard for me to watch videos or read about dogs that have been abused. I’m with you, if I saw the person that ever did that I would lose it. I’m a nice person but this world doesn’t need people like that in it. Animal cruelty is beyond words. I’m glad he’s doing so well now though and oh so loved. You just keep taking care of yourself because the family doesn’t need anything happening to you. Glad you liked Dog-dog’s visit to my blog. It just makes my blood boil when I hear of cruelty to any animals – especially dogs, because they’re just so loving. No doubt cat-lovers and hamster lovers etc feel just the same, so apologies to them all. If you could see him now…. he’s sprawled across the sofa, legs in the air and eyes closed. Probably about to protest that I have left him to catch up on a few comments. All the “firsts”, after the death of a loved one, are terrible. They don’t get a lot better, but the first is always the worst. Funnily enough my Dad has taken up reading (fiction) which he’d never had time to do before and that’s helping him. Although he confessed to me that sometimes he skips a few pages if it gets boring!! I’ve known books like that too. Well, I’d better pop back to my dog-stroking duties. I hope you’re starting to feel better too, Adrienne. Have a good week, and thanks for your visit. Love the topic of dogs as I was raised with pet dogs and have always had one. I’m with my daughter in Tampa, Florida, and she has a boxer/lab mix named Sierra. She’s the sweetest thing – and getting old, 13 now. That’s quite up there for large dogs, but she’s in very good health. I’m so glad that Dog-dog was rescued and has a happy ending. Definitely enjoyed the quotes – thanks for sharing. Hope you’re steadily doing better, Joy – will keep you in my thoughts and prayers. Glad you liked the change of topic – nothing like thinking about abd cuddling dogs to soothe the soul. Obviously bad days and better days. Seeing my Dad arrive without Mum was a real low spot – but we talk about the good times and there are plenty of happy memories. We always had dogs when I was a child, but then there were plenty of folf about to look after them. Not so easy for me, sadly. Still – I’m enjoying Dog-dog this week, and Bailey and his Mama and Dada are visiting next week, so I’m very lucky. Sierra’s reached a great age – so pleased she’s in good health. My other son’s dog Bailey is a lab/collie and he’s 7. Hope he reaches the same age as Sierra. He’s certailny well-enough looked after that he should! What a Great post my friend Not to worry that your story about Dog-dog was out of place because it was not. Who is to say that it is? What you write on your blog is yours to do. HUM? Did that make sense? I had someone visit a while back and this person asked me what My blog was about and why I was sharing positive affirmations when I should be sharing how to get market online? REALLY? This is my Blog! My Real Estate and like yourself here if I choose to talk about Dog-Dog I will do so. I’m glad you too felt the Dog-dog story was fine. It was under the category of “Life of an Internet Marketer” – and this is my life at the moment! I’ll get back to the fast cars, mansions and yachts one day…. (I wish)! Fancy that visitor criticising your content – people really are the limit sometimes. You’re right, your real estate, and mine. We pay for our hosting, we choose the topic! Let me know if you know something about this topic too. This is very funny blog quotes indeed, i am refreshed anyway, thanks for sharing. Glad you liked it – and the purpose was indeed to give everyone (especially me) a break! From the past few days I am observing some kind of glitch in your site. When I open it sidebar isn’t shown and sidebar items are below posts. However it looks fine on some pages. So pleased you enjoyed my story about Dog-dog. Yes, I’m in need of some soul-soothing at the moment – family-wise and work-wise – and he’s just the ticket. Although I am finding him a little more mischievous than I originally suspected. But, hey, my garden was no work of art before he started digging in it LOL. FOUR dogs – wow! I have my other son’s dog coming to stay tomorrow so I will have two, and when I start worrying how the two will get on together I will think of you and your four bundles of love. Keep up the good work, Joy. It was refreshing for me to have a break when I was busy with family – and dogs! Hi Joy, Well, I love dog stories. We have two JR terriers who are 14 1/2 and also love us love us unconditionally. I loved hearing about Dog-dog. We all need a Dog-dog in our lives… like my two… Bubba Cletis and Reesie Pup… named by teenagers at the time they became part of our family. Glad you liked “meeting” Dog-dog, and I’m sure your two are real sweethearts too. Sadly Dog-dog has just been collected and has returned to live with his own little family and I already miss him. This is Basharath, this is my first visit to your blog. I’m glad you liked my little diversion to write about my love of dogs. I’m getting back to more blogging related matters with my current post! How did I miss this emotional and heart-warming post? As my favorite posts are antidotial, happy I found it. Love Dog-dog’s name, btw. I suspect Laura and Russ may have purposely left DD with you so he could help you deal with the loss of your Mother. I’m with you about animal cruelty, sickening and beyond my understanding. Glad you enjoyed the post – if I remember rightly it might have been at the time of your move. Yes, you’re right I was really down at the time, and having Dog-dog close by was a great help so they did me a favor. Although the lawn has never recovered LOL. When dogs give so much to humans it sickens me how some humans aka morons (and worse words) treat them.